In mid-October this year, ten days after I became ABD, I completed the Fortune Collection. I created four pieces for four very special women: Maya Angelou, Toni Morrison, Joanne Gabbin, and Nikki Giovanni. The occasion, Sheer Good Fortune, was for Toni Morrison, but was a celebration for what these women and others like them have done, are doing, and will continue to do, that is, create more beauty in the world through creation, cultivation, and circulation of the creative written word. I give special thanks to L. Lamar Wilson, author of the forthcoming poetry collection, Sacrilegion. Without Lamar, this jewelry series would not have existed. I thank him for giving me the opportunity to help shape his vision into material form. I have designed these four pieces especially for Maya Angelou, Toni Morrison, Joanne Gabbin, and Nikki Giovanni by the loving request of Lamar Wilson. Lamar envisioned four pieces that would unite four women who share a passion for written and spoken word, be it poetry, fiction, or nonfiction and then left me to my creative whim. I’ve named each piece Fortune followed by the initials of the woman for whom it is designed in recognition of the Sheer Good Fortune event in honor of Toni Morrison and to capture the spirit of such an auspicious gathering of so many people who love and appreciate the art of carefully crafted language. 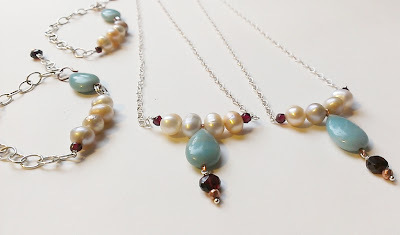 Amazonite, freshwater pearls, garnet, and copper coated pyrite are present in each piece of jewelry. Sterling silver, copper, and rainbow-torched copper unite the colors of the gemstones and reveals my love for mixing materials. Early on, Lamar and I decided sterling silver would be a good metal to tie the pieces together. The copper came later; its presence reflects my love for the warmth and richness of the metal, and for the way it patinas with age but can easily be made like new again. In the beginning, I knew that garnet would be a chief stone in each piece because of its many beneficial properties. Garnet aids a number of physical ailments, protects bones and joints, imparts a sense of clam while providing adrenal support, inspirits courage and creativity, and aids passion and intuition. After a few preliminary sketches for these pieces, I had a vivid dream in which amazonite and pyrite were prominently featured, so I knew that these two stones would be included in the design. Amazonite calms, encourages happiness and good health, and, perhaps, most important, it is a stone associated with writing and communication. Pyrite is an all-around protective stone that helps with dream work and dream recall; it is also known for inspiring creativity and imparting good fortune. Associated with spirituality, feminine energy, the heart, and protection during travels, the four freshwater pearls in each piece also represent the unity of and the love shared between the four women. Each pearl is differently hued and shaped, lovely and iridescent. Copper is another material that aids communication and circulation, soothes joints, enables channeling, and imparts a bit of luck; silver adds more protection and increases the properties of the gemstones. Finally, I created each piece with positive intention, love, and joy. I am humbled and honored to have the opportunity to share my vision with you all, just as the body of crafted language you all have birthed, nurtured, and empowered has helped shaped the vision and purpose of my own life. I look forward to creating more commissioned pieces and collections in the future!